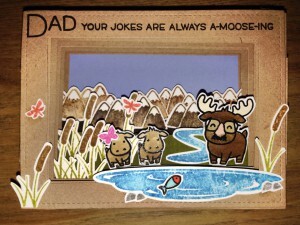 I made this card for my father for Father’s Day. He is a dairy farmer and loves Brown Swiss cows. 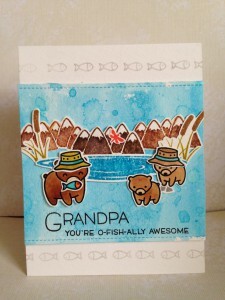 Extra Details: I began with this card by creating a card base from water color paper. Using my acrylic block, I ink smooshed some yellows and greens on the card base. I used a wet paintbrush to move the color around a bit. 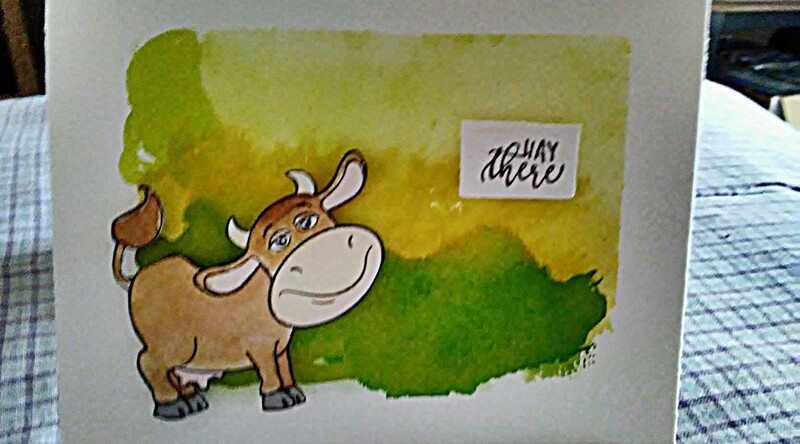 While the card base was drying, I stamped the cow on another scrap of water color paper and used Distress Inks to water color it in. Once dry, I fussy cut the cow out and painted the edges. I stamped the sentiment on the same scrap of water color paper and trimmed it out. I adhered both the cow and the sentiment with foam tape. This is the Father’s Day card my children designed for one of their grandfathers. 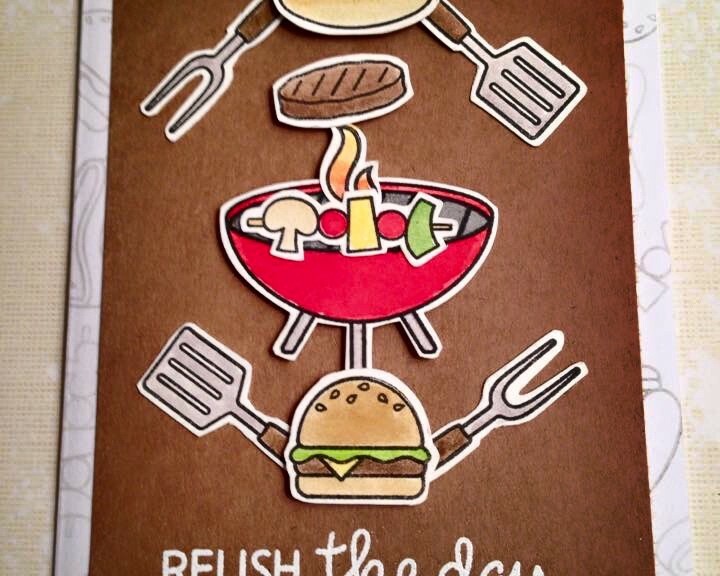 Extra Details: I began this card by digging out of the colored and cut images I had form the Let’s BBQ set. I know that I used Distress Inks to water color all of the images, but I am unsure of which colors I used. Once I had all of the images, I started playing with my layout. When I found something I like, I adhered everything to a panel of kraft card stock. I made sure to leave room at the bottom for the sentiment. I adhered some of the images flat and used foam tape on others. I white heat embossed the sentiment to help it stand out. Next, I grabbed a white card base and stamped more images on the edges using Barely Beige ink. I stamp a sentiment on the inside also and added two more images. Lastly, I adhered the kraft panel to the card base. Father’s Day is in two days. I realized that life has gotten away from me again and I haven’t made cards for my father or my father in law. EEK! This is the card for my father-in-law. Extra Details: I started by die cutting a stitched square from water color paper. I ink smooshed some Salty Ocean, Tumbled Glass and Mermaid Lagoon Distress Inks on the panel. I also flicked some water droplets on the ink to create more texture. 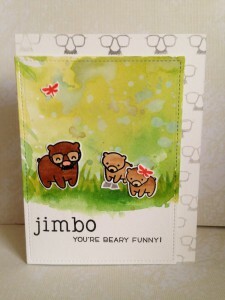 The bears and other images are water colored with Distress Inks and fussy cut out. I stamped the sentiment on the bottom of the panel and adhered the bears. Then I prepared my card base. I cut it, scored it, folded it, stamped the sentiment on the inside, and added the date and blog on the back. Then disaster struck! I realized I had stamped everything for a vertical card when I had made my panel for a horizontal card. So I just added a line of fish at the top on bottom of the card base. I popped the panel up on fun foam and called it a day. Father’s Day is in two days. I realized that life has gotten away from me again and I haven’t made cards for my father or my father in law. EEK! 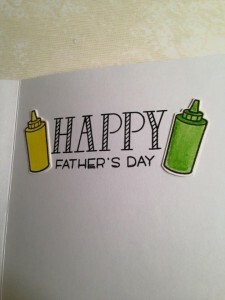 This is the card for my father. Extra Details: I started by die cutting a stitched square from water color paper. I ink smooshed some Crushed Olive and Mowed Lawn Distress Inks on the panel. I also flicked some water droplets on the ink to create more texture. After the ink had dried, I used the Grassy Border Die to create a mask. 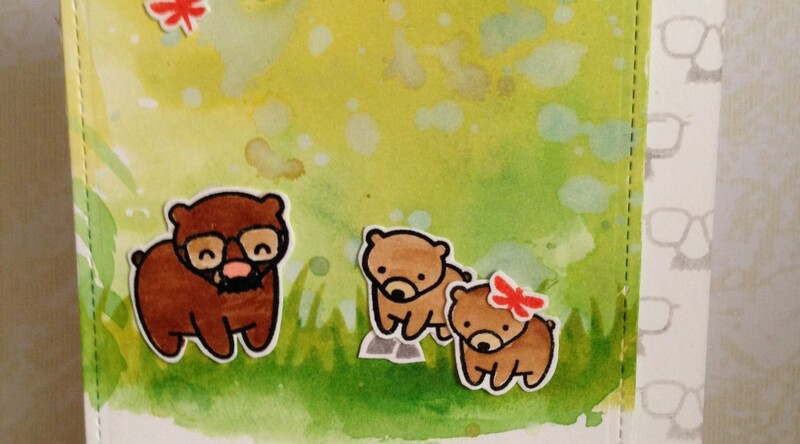 I ink blended some of the same distress inks on near the edge of the mask to make some grass for my bears. 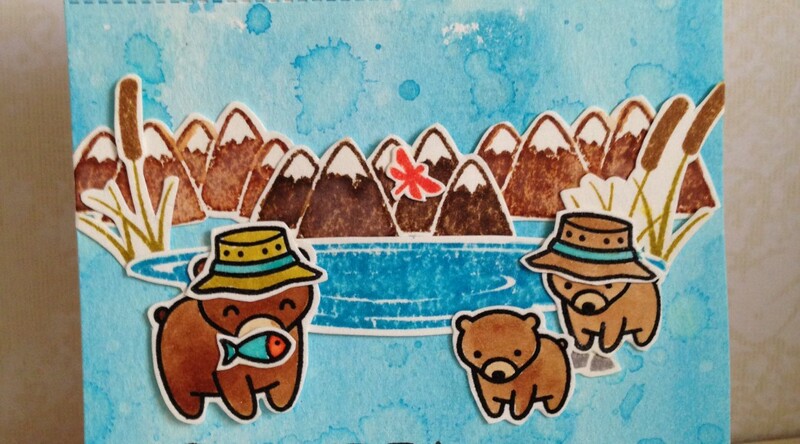 The bears are water colored with Distress Inks and fussy cut out. I stamped the sentiment on the bottom of the panel and adhered the bears. Then I prepared my card base. I cut it, scored it, folded it, stamped the sentiment on the inside, and added the date and blog on the back. Then disaster struck! I dropped it on my black ink pad. I almost cried, and then I thought up plan B. I stamped the card base with the funny glasses and offset my panel to cover the extra ink. I popped the panel up on fun foam and called it a day. Father’s Day approaches and my kids have lots of ideas. 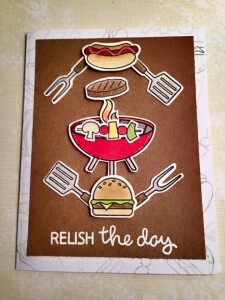 They loved the Veggie pop up diorama card I made and wanted to made a similar one. Here is what we came up with. . I got the directions from https://littlegreenbox.wordpress.com/2012/11/07/pop-up-diorama-tutorial/. I found the tutorial very easy to follow. My favorite part is that this card will still fit in a regular envelope. I did adjust the measurement to fit the dies that I own. 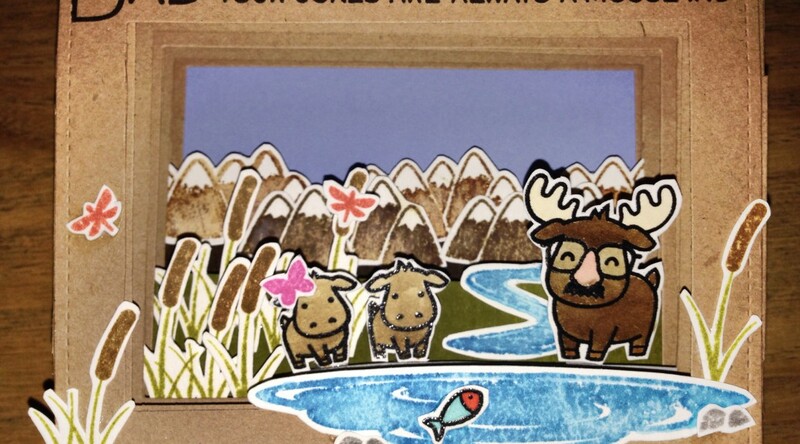 Extra Details: First, I stamped and colored all the images. The outline images were stamped in black ink and heat embossed with clear embossing powder. The solid images were just stamped in Distress Inks. I water colored the outline images in with Distress Inks also. I fussy cut all the images out. I die cut 9 frames form kraft card stock. Following the directions at Little Green Box, I put my frames together to make the pop up diorama. My kraft card stock is on the thin side so I used to frames for each layer and one on the blue sky bottom layer. 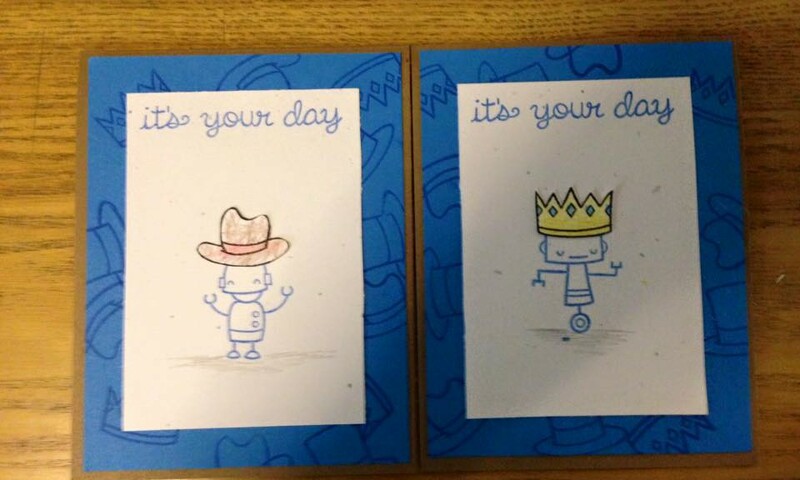 These are the Father’s Day cards my kiddos designed for their grandfathers. Extra Details: We started with a small white panel. We stamped the robot and sentiment in blue ink. 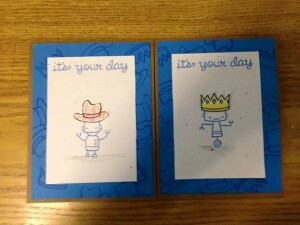 I stamped the hats on a separate piece of paper and fussy cut them out. The kiddos colored the hats with colored pencils. I stamped more hats in blue ink on blue paper for a tone on tone layer. Everything was adhered to a kraft card base.